TAS is a full-service training academy for the player who strives to achieve the best they can in tennis, academics, and character. 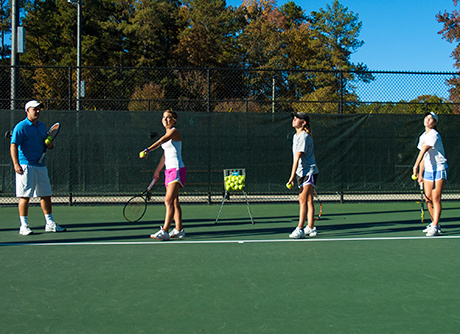 The Tennis Academy of the South has the staff and resources to allow any player to reach the level of excellence they desire: high school team, advanced junior competition, collegiate tennis, or the pro circuits. Please review the programs we offer and then contact us to discuss your player's goals and ambitions. Unlike many other academies, TAS builds programs around the needs of the player and not the player around the programs needs. It is never too early to start playing the game of tennis! TAS has developed age appropriate programs for every age group from age 4 and up! The TAS Academy program is the core of the junior training program. The Academy program allows each player the opportunity to grow within a commitment level in which they are most comfortable. It is important for TAS parents to recognize that drill sessions do not take the place of private lesson instruction. Private lessons are necessary to work on your junior's individual needs, not the set agenda in the drills. All of the TAS instructors help run drill sessions and set their own private lesson schedules. Please contact the academy office or the desired pro for more information or to schedule your private lessons. Private lesson instruction is paid directly to the pro. The Tennis Academy of the South is not responsible for any aspect of private lessons including medical liability.